Words by Kevin Doocey on January 19, 2009 . Well its very hard to be Newcastle supporter during this time, we face uncertainty and the January Transfer window hasn’t gone well so far. Peter Lovenkrands and two loan possibilities will play tomorrow in a friendly v Carlisle. If they see Lovenkrands good enough and likewise for the two loan possibilities then we could well have 3 players in on Wednesday. It is exactly what we need, numbers. We’ve 11 days break until we play City in Eastlands, a City team that could include Robinho, Kaka, Nigel de Jong and Craig Bellamy. We can’t worry too much about their scenario though and need to get on with ours. If nothing is done during this window ie bring in new faces then Mike Ashley will come under more deserved pressure, if he fails to fund this transfer window as well as The summers then we could well stare relegation in the eyes. Too frightening of a thought for any Newcastle fan. It is sad to see this, Newcastle once one of the most high spending clubs in England although we didn’t spend wisely on occasions (Boumsong, Luque etc :() are now spending less than Stoke and Hull, so far anyways. We’re plagued with injuries and now Kinnear has said if he is to sign a new contract he will want all power in the transfer window, sound familiar? 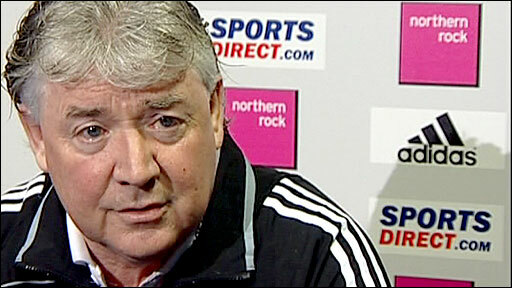 Kinnear was in France last night to watch Stephane M’Bia and Adil Rami and maybe that is why he hasn’t spoke today. M’Bia was not too impressive in his game last night and was lucky to have not been shown a red following a rather rash challenge. Reports elsewhere claim Man City has upped their bid for Shay Given £14m, perhaps too big of a number for Newcastle to refuse. Uncertainty still remains, our transfer window hasn’t eased the pressure, maybe 4 new faces before the end of the week could well cheer us up, a little. I'm really disgusted by the football market nowdays. The players are bought and sold as cattle, with no loyaty involved whatsoever. And can we really blame them. Can I say I wouldn't go crazy if someone would be daft enough to give me thousands and thousands of pounds every week? I can't... But just a thought of Boumsong and Luque makes me shiver. Although Keegan was not backed in the transfer market, I'm actually happy with the quality of players brought in, I'm just dissapointed there haven't been 4 or 5 more player coming in. And to sell Milner was pretty sad. He may not have been Ronaldo but he worked very hard and as a honest football fan I quite like that... Cmon, Ashley, let's see DA moneeeey :) Cheers!